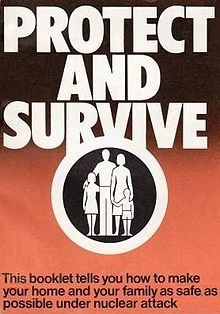 In May 1980 the British government published its “Protect and Survive” public information leaflet, supplemented with radio broadcasts and 20 television infomercials, with advice on what citizens should do in the event of a nuclear attack. This included such pearls of wisdom as ” make a refuge under the stairs” and “lie flat in a ditch”. Such advice is laughable, and the government knew this, withholding the information from 1976 and only ever intending for it to be published 72 hours before an imminent attack. They knew that otherwise the campaign would become the subject of ridicule and be rendered ineffective. It was only after the adverts were leaked and broadcast by the BBC’s Panorama in January 1980 that the information campaign was officially made public. The illusion of protection and possible survival needed to be maintained; just like those safety cards we ignore in planes assuring us that a crash can be survived by placing our head between our knees. 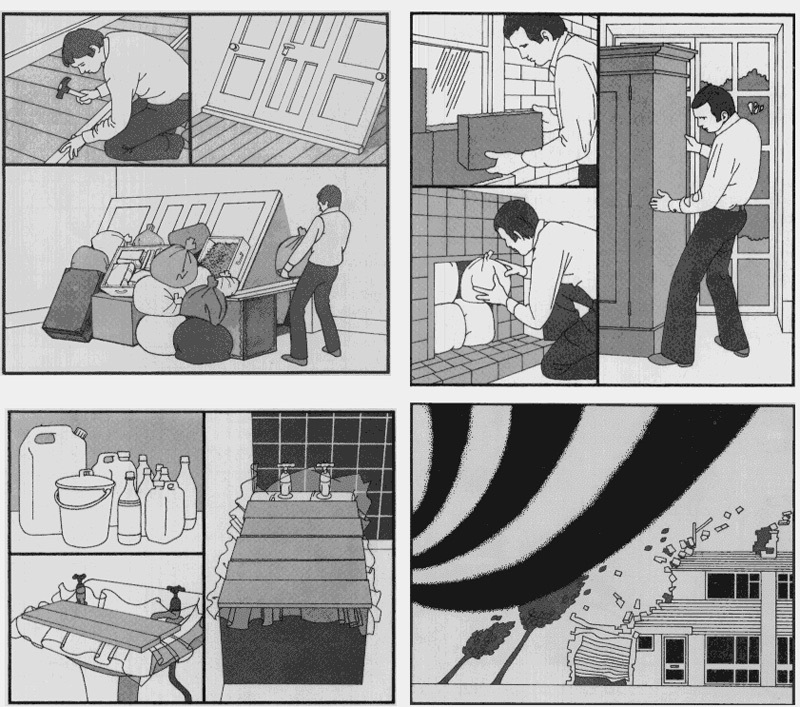 Images from the “Protect and Survive” leaflet. At the time, the campaign was criticised by CND (the Campaign for Nuclear Disarmament) for implying that nuclear war was survivable, while figures were suggesting a less than 50% survival rate, or the deaths of over 30million UK citizens. While the leaflet does concede in its opening chapter that, “everything within a certain distance of a nuclear explosion will be totally destroyed”, the extent of this is very much downplayed in favour of advice on whitewashing your windows and sandbagging staircases. The long-term implications of a nuclear attack are also diminished when readers are told that after 2 weeks in your shelter, on hearing the all-clear siren, “you may resume normal activities”. The 1980 government information campaign only highlighted the ludicrous nature of the MAD (mutually assured destruction) policy of the Cold War, while at the same time, despite the obvious ridiculousness of the advice, instilling a great sense of fear and foreboding. As such, interest in and membership of CND and the anti-nuclear movement increased. 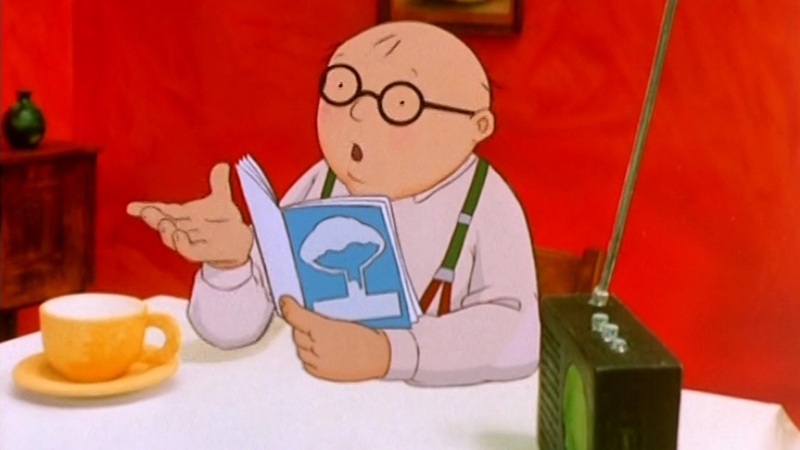 This may have also been contributed to by movies such as Threads (1984), portraying the results of a nuclear attack in Sheffield, and The Day After (1983), set in Kansas, as well as Raymond Briggs’ comic and animated feature When the Wind Blows (1986), which makes devastating use of the British governmental advice. Certainly, as a child growing up in the UK in the 1980s, the fear was palpable and there was a genuine belief that any day could be our last, regardless of any sandbagged lean-to in the basement. BBC Podcast on the background of “Protect and Survive”.